Not too long ago, building operations in commercial real estate was a black box. The performance and condition of the critical infrastructure, especially in older assets, was simply impossible to determine without being physically present. And it shows; an analysis of over 200,000 work orders found that 98% of tickets were for fixing existing issues, while only 2% were for preventative maintenance. In recent years, the situation has improved. First, master meters were digitized to provide real-time visibility into the utility consumption at the building level across a portfolio. This helped with high-level benchmarking and monitoring for issues such as peak demand management, but lacked the level of granularity necessary to be actionable for on-site staff and building engineers. Then came real-time performance tracking and advances in fault detection for the equipment that make up the critical infrastructure within buildings. This moved building data and analytics from a purely reporting exercise to an indispensable tool for streamlining building operations and reducing the operating expenses related to maintenance and utilities. Real-time tracking and analytics for the individual pieces of equipment that make up a building’s critical infrastructure has created an unprecedented level of transparency for owners and operators. However, there is still white space that submetering solutions cannot fill alone. This is where targeted Internet of Things (IoT) sensors, which capture real-time data from physical objects, come into play. Each asset will have different needs and face different operational issues, so being able to deploy IoT technology in an intelligent way will be increasingly important as the technology gains mass adoption. Here are seven of the most common sensor types and an explanation of how they can be deployed to drive value in commercial real estate. Any building operator knows that leaks and the resulting floods in tenant spaces and/or mechanical rooms must be avoided at all costs. Repair and remediation expenses can easily cost hundreds of thousands of dollars and cause insurance premiums to rise significantly, and even cause insurance providers to drop the asset. In fact, water damage claims cost insurance, on average, three times as much as a claim that does not involve water damage. And it’s not an uncommon problem; water damage claims account for more than half of all commercial real estate insurance claims. Equipment-level performance tracking can uncover flooding in some instances, such as when basement sump pump demand spikes during heavy rainfall. However, there are many other instances of leaks that cannot be detected through equipment performance. Wireless IoT sensors throughout a building can detect leaks the moment it occurs, feeding a system to notify operators, mitigate the worst effects, and save hundreds of thousands of dollars. Unlike leak detection, which is a relatively straightforward use case, temperature sensors can be deployed in a wide variety of ways. Building management systems (BMS) have used temperature sensors for decades to provide the input for automation and controls in higher end assets. Now, as the cost of IoT sensors have plummeted, older assets can supplement equipment performance data with temperature sensors to go beyond the insights that can be uncovered by equipment-level data alone. In other cases, temperature sensors can be deployed similarly to leak detection, as the source of fault detection itself. For example, sensors can be deployed to detect evidence of overheating caused by loose or deteriorated connections, overloaded circuits, and load imbalances in an electrical enclosure. These sensors can provide year-round monitoring of electrical system and immediately alert personnel when problems arise. Indoor air quality is becoming a significant factor in leasing decisions, especially for office tenants for whom employee productivity is of the utmost importance. For a long time, indoor air quality was focused around harmful contaminants such as volatile organic compounds (VOCs) and airborne particulates that cause illnesses. Recently however, indoor carbon dioxide (CO2) levels have become an equally, if not more, significant measure of air quality. Studies have shown that CO2 impairs our brain’s ability to make decisions at levels as low as 1,000 ppm. Many offices have been found to have levels as high as 1,700 ppm in conference rooms and other densely-packed areas. 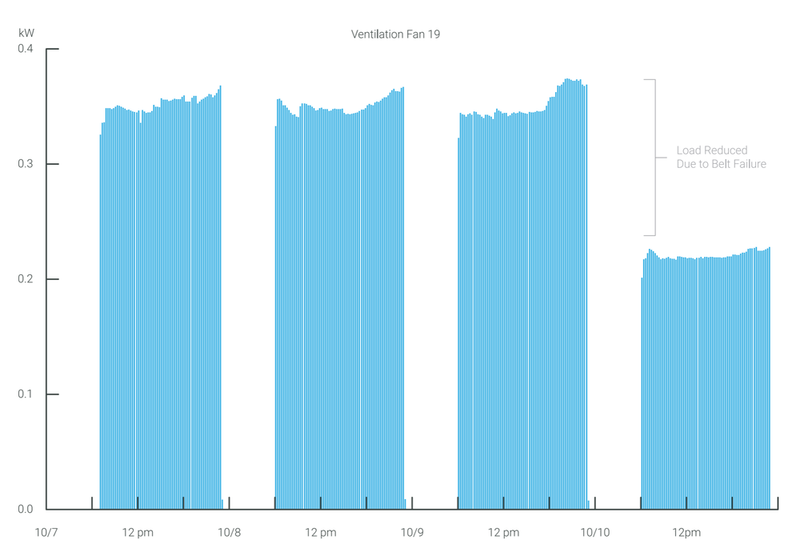 Equipment performance has proven very effective at detecting malfunctions with ventilation units designed to ensure a healthy indoor environment. However, tracking the downstream effects through air quality sensors not only ensures that maintenance activities are having their intended effects, this also allows owners to market the property with precise air quality data. As tenants become more sophisticated in their understanding and demands of healthy environments this will become increasingly important. When equipment-level performance data is aggregated, the occupancy schedule for a building becomes relatively obvious. Demand on the equipment systems rise and fall with building occupancy and analytics programs can infer a building’s schedule after a week or two of data collection. Still, tracking occupancy down to each individual in real-time using occupancy sensors can produce more specific and accurate insights. For example, equipment configuration adjustments, such as starting up systems later in the morning or throttling down systems during the lunch hour, can be performed in a much more granular way when driven by real occupancy data. This is one of the most effective ways to optimize building operations and the cost of deploying sensors can usually be quickly recovered with adjustments like these. One of the most exciting developments in maintenance driven by equipment-level performance data is the application of machine learning to predict faults before they occur. However, not every equipment fault can be identified in performance data derived from electrical consumption. If an asset is routinely experiencing issues with motors for example, it may make sense to supplement this data with vibration sensors. The cost of vibration sensors has fallen dramatically. Usually installed directly on individual motors, these IoT sensors record the level of vibration for mechanical equipment continuously. In most cases, there will be abnormally high vibrations well before critical equipment failure. Detecting this warning sign helps building operators perform proactive maintenance instead of reactive repairs. Thanks to a range of government weather data sources, getting detailed, local weather data is not difficult. This data is crucial for building operations, as the outside temperature is the single largest determiner of utility consumption. Nevertheless, government-based weather sources will never be as accurate as IoT weather sensors placed on site. For example, as explained in our video, Are You Losing Money to This HVAC Mistake, many buildings have suboptimal set points for their HVAC equipment. The example used in the video shows a chiller plant that begins operating when the outdoor air temperature is 40 degrees. This set point can be increased, reducing costs while still maintaining tenant comfort. Because each degree of set point change translates roughly to a percentage point of savings, data derived from on-site weather sensors can help determine the optimal set point and maximize savings. Some assets have enrolled in incentive schemes like Con Edison’s Interruptible Gas Program in New York. Under this scheme, the operators agree to switch from natural gas to oil when prompted during particularly cold periods. In return for compliance, the building receives a lower rate on gas, but there is also a large penalty for non-compliance. To ensure that the building has enough oil to meet requirements and avoid regulatory penalties, operators can deploy IoT sensors to track tank levels. They will receive an alert as soon as tank levels fall below a certain threshold. The beauty of the IoT is that data can be captured very affordably, and sensors can be deployed strategically to solve existing problems. The tricky part is ensuring that your asset doesn’t end up with an extra half dozen siloed software systems. Over time, building operations will be like using your phone’s GPS today. Operators will be fed a stream of optimal and sequential activities to perform, resulting in less time spent investigating issues and fixing problems, and more time performing routine maintenance and making intelligent configuration adjustments. The exact path to that future will be different for each asset and portfolio. But it cannot be ignored because soon it will become a competitive differentiator in the market, and thus a necessity to the growth of your business. Enertiv's platform has been designed to digest all varities of IoT data. Schedule a demo today to see the various data streams we analyze on a continuous basis.